So you’re looking for something that is a bit more “vintage” or contemporary? Well you’re in luck because today I’ve compiled the best contemporary coffee tables which include the very royal and classic looking wrought iron coffee table. I hold a very special place in my heart for these tables as my mother was a huge fan of “olden days” stuff. These are the kinds of tables our household had as we were growing up. Even though I didn’t know it at the time I really like them. Anyway’s enough with my rambling. 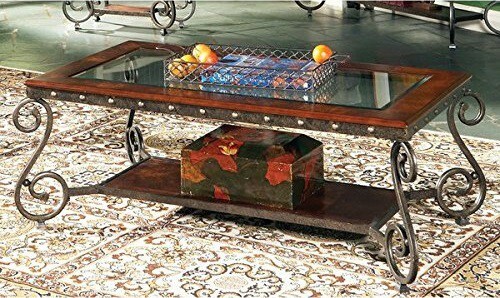 spoiler alert – check out the best wrought iron coffee table here! These kinds of tables are especially great if you are going for a specific kind of look kind of “medieval” if you will. Nevertheless, I’m sure you can get really creative with these tables. The main attraction of them of course is their beautiful iron frame which usually features a natural slate top. Sometimes the top is glass as well and even natural slate encased in wood. We’ll go ahead and examine today the top styles that I’ve encountered in my time. I’ll be sure to break down the dimensions and specifications of each to help you narrow your choices down. Let’s dive right in shall we?! A great example of a wrought iron coffee table. Not as “busy” as others but it still gets the job done. I always like to start off with a more classic looking example of each table I am deciphering in this blog. This one is no exception, allow me to present the contemporary black cocktail table by Ashley Furniture. 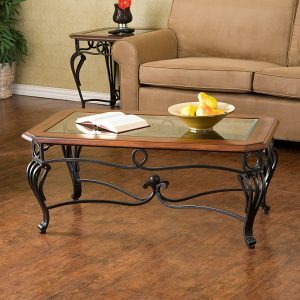 If you’re looking for a wrought iron coffee table with not too much “flair” then this is it. It features a very nifty storage shelf that’s as solid as a rock (or slate stone?). The natural slate top is one of the most magnificent I have ever come across. All the colors are natural in appearance. Some are” bluish” while others have a cream tone to them as well as a charcoal grey and even a greenish tinge in the mix. It’s the quintessential example amongst the contemporary coffee tables. Keep in mind these tables are very heavy seeing as how they are made of iron and slate. The size of this table is 20 x 48 x 24 inches and assembly is a bit more involved but still not too difficult between two people. An excellent choice if you decide to go this route. 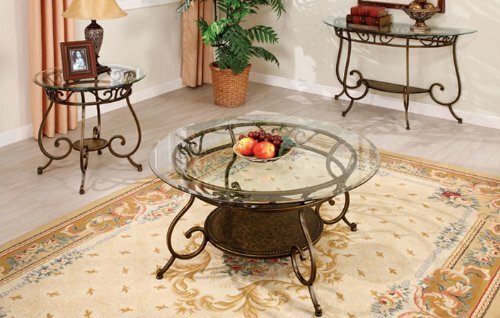 Going against the traditional wrought iron design this table features a glass insert. A mix between glass and wrought iron. I like it! Now that’s a wrought iron coffee table! Take a look at that majestic and elegant scrollwork or the wrought iron. Finished in dark cherry and black it will look absolutely stunning just about anywhere. This one has a glass top with a wooden nest surrounding the edges which gives you the best of both worlds. It brings your room together while still making the space look ample and spacious. The technical specs of this table features the 5mm tempered glass top which is beveled as well as dimensions of 24 x 42 x 18 inches. A perfect size and fit for almost any room you decide to place this piece in. Easy assembly and stable as can be. The wood does have a rustic look to it so if you’re the kind who likes to mix things up a bit then your search is over! A classic example of a wrought iron coffee table. Look at those scroll patterns. Another magnificent table by Ashley Furniture this time it’s round. Thought I’d show you this one because I haven’t included to many round table options for those who come to read my blog. This is up to you whether you’d like a rectangular shape or rounded. You can read what I have to say about the pros and cons of each here. Now this table features a very graceful wrought iron design which is simple and gets the job done. I like to keep things simple so that a plus one from me. It’s sturdy and durable being iron and all. Now the table top of course is rounded and features a nail head trim, it’s hand finished and constructed of manmade wood. This table measure 42.4 x 42.4 x 19.9 inches. The height might be a bit tall for some so be sure to check your sofa seats to see if this will work for you. 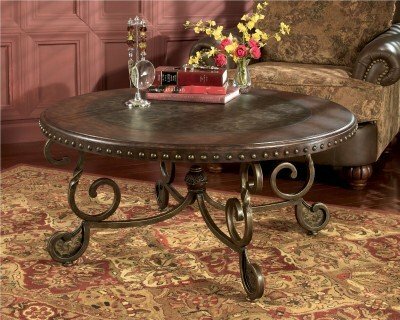 Other than that it’s an excellent choice for those looking for a round wrought iron coffee table. I can’t help it. Scroll patterns and glass inserts go well together. 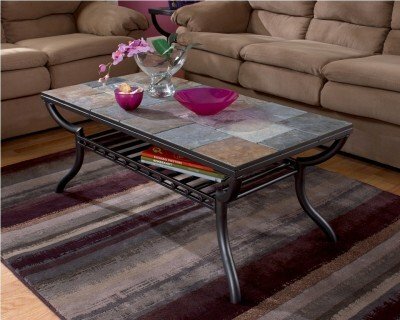 The peanut butter and jelly of wrought iron coffee tables! Similar to our second table in this post but with a more exaggerated wrought iron look to the supports. Those elegant looking scroll supports really scream out wrought iron. Anyhow this table features a glass insert and yes it’s tempered. Also it features a nail head trim, burl veneers, and a medium cherry finish. It does have a storage space even though it’s a bit small it works great. The size on this table is 20 inches high x 50 inches wide x 28 inches’ deep so again the height is tad higher than usual so check those sofa seat heights and determine if this will work for you. Let me tell you though this table is as solid as a rock. It can take quite a bit of abuse, with the obvious exception of the glass. Just be careful with those scroll patterns because they do stick out quite a bit and could be a tripping hazard if you’re not careful. The Poundex Rounded Coffee Table. Round, Bronze, and large scroll patterns plus a full glass top. A stunning piece to say the least. Thought I’d finish this off by introducing another rounded table. This one’s top is entirely glass so this might belong in another category but I thought it fit best here. This does after all have a very beautiful wrought iron design with very large scrolls as supporting legs. One of my favorite things about this table is the bronze finish which gives it a clean yet “weathered” kind of feel. It’s strange as you have to see it in person to fully appreciate this effect. It is a bit heavy due to the iron and glass. I believe it comes in at about 70 pounds. Assembly is easy just make sure you center that glass top perfectly. Also be careful again with the glass both in handling, setting down materials and cleaning. This table is 40 inches in diameter and 20 inches high so plan accordingly. I also forgot to mention it does have some storage space as you can see in the picture. I usually kept it free of anything though because I do love that bronze finish and wanted to show off every aspect of it as I could. The final verdict on the wrought iron coffee table. Well that’s about it for now. I laid out what I believe are the best in the wrought iron coffee table world. I hope this helped you narrow down your search and finally help you make an informed and educated decision. I’m going to go ahead and recommend my personal favorite to you which is the Prentice Cocktail Table. The best thing about this table is the wrought iron pattern is unlike any I have seen before. It retains that elegant look a traditional coffee table would display. The tempered glass insert with the wooden “frame” is a definite pro as it gives you features of both kinds of coffee tables. Perfect for those (me) who want it all. If you have any questions send me an email here. Thanks! Previous Previous post: Which is the best acrylic coffee table? Take a look here! Next Next post: I think I’ve found the perfect trunk coffee table.